My heart is weighted today with sadness. You see, yesterday we had to put our dear little Phoebe the cat to sleep. After more than a year of declining health due to kidney failure, she had finally reached a point last weekend where we felt the kindest thing to do for her was to help her to die so she would no longer have to suffer. But still, even with the peace I feel on an intellectual level--knowing resolutely that we did the right thing--my heart still hurts because I loved her and she was such an important member of our little family. The painting above is testament to this. Mr Beeper commissioned this painting of Phoebe from the ever-so-talented Amy Lynn many years ago as a surprise for my birthday (perhaps the best gift he has ever given me, I might add). And to me that painting so right-on captures Phoebe's soft and kind spirit. Yes, kind. She was one of the most tolerant animals I have ever known--in fact, I only know of one time that she ever intentionally scratched or bit anyone. She had that zen-like peace down, I tell you. Part of the reason Phoebe was so special to me is that she came to me through some unusual and tragic circumstances. You see, I used to be a director of a non-profit that supported people with mental illnesses and disabilities. T. was one of my clients--he was schizophrenic, anxiety-ridden and depressed. I worked with T. for many years and had the pleasure of getting to know him quite well. He had 5 cats--all of which really formed the center of his life and I think kept him alive for many years as he felt a duty to them. 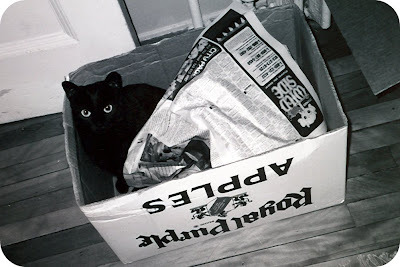 Phoebe was the cat he had the shortest period--he found her as a kitten, in the rain, by a dumpster, meowing and lost somehow. So, of course, he took her in and added her to the pride. 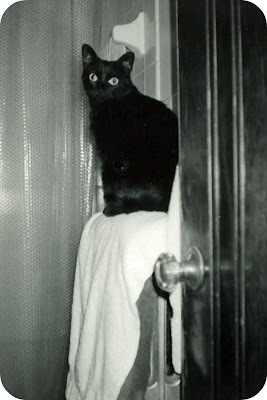 Well, of all his cats, Phoebe was always my favorite--just because she was sort of anti-social with the other cats and she liked to hang out inside his cupboards, but when I came over she always came out to greet me--which T. let me know was very unusual. 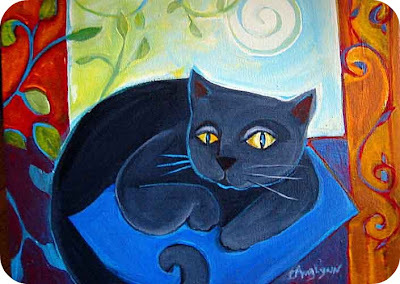 One Christmas, T., wanted to give Phoebe to me as a gift because he knew how much I liked her--I, of course, was immensely touched by his gesture, but I did turn him down because these were T.'s cats and should be his cats. Ultimately, overcome with depression at the limitations of his life, T. committed suicide. It was awful. Almost right away I thought of his 5 cats and set about ensuring they were placed in a shelter so they could be adopted--as I knew T. would have wanted. Well, a couple of weeks passed and I could not stop thinking about dear little Phoebe and wondering how she was. So I rang the shelter and they told me all of T.'s cats had been adopted EXCEPT for her. How could I take that but as a sign that she was meant to be with me? So I went down to the shelter right away. When I arrived, they asked me if I was sure I really wanted Phoebe because she was a very aggressive animal, had bitten several people, and they had been planning to put her down as they did not think they could adopt her out. I was shocked to hear this because the cat I knew was nothing like this. When they took me back to see her, her fur was all riled up, her eyes gleamed wildly, she growled at the attendant and I could hardly recognize her as being Phoebe. I asked them to take her out so I could see her--and I will never the forget how the attendant looked at me--like, Whatever, crazy lady, handle her at your own risk. So they put on enormous gloves that look like something you would use to handle burning objects, and brought her to an enclosed room. This I remember so clearly--as soon as they shut the door--I looked at Phoebe, and said, "Phoebe, what's going on, honey?" And all her fur smoothed down and her eyes became gentle again and she meowed and came right over to me and rubbed her head against my arm. And then I knew without a doubt that Phoebe was meant to come home with me. And so we have been together for many years--like 13 years. I know she was at least 16 when she died--and may have been older since I do not know exactly how long T. had her before I knew him. She was a fantastic pet and we are all missing her terribly right now in the house. Beeper and I printed out a bunch of photos of her early this morning and he put them in a new photo album that he has been carrying around all day. I keep seeing her pass into the room out of the corner of my eye--tricks of the light or my heart or something. And Mr Beeper had already declared that he misses the thump-de-thump of her coming down our wooden staircase to greet him whenever he came home. Dear little Phoebe, you will always be in our hearts and part of us. Just as I told Beeper last night. Cliche perhaps, but you do live on inside of us and we carry you with us. Forever, dear little Phoebe. Thanks to all of you for reading this and for listening. It is good to know someone besides us knows about Phoebe and her story. We all have dear pet stories like this, I know, but it is still so good to be able to share. Bye bye lovely Phoebe, you sure knew how to pick your perfect family, they will always remember you. thanks for sharing your love story with Phoebe. very special kitty, indeed. Aaahhhh, so sad...such a wonderful post in tribute to your dear Phoebe...may all the memories remain in your hearts. Oh, poor baby-cat. You guys must be so sad. I've got leaky eyes just reading this, and my heart goes out to you. Thank you to everyone leaving such thoughtful comments about Phoebe. Thank you for caring. I'm so sorry for your loss. I had to say goodbye to a dog earlier this year, and I'll tell you that it does get easier, but I still think I hear her in the house sometimes; I still expect to see her when I come home. Hugs to you and your family. I am very sorry for your loss. 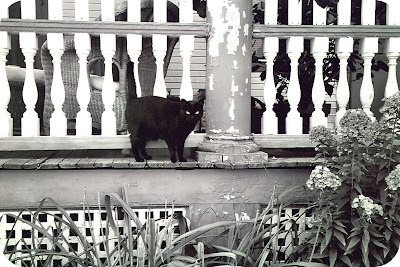 We had a similar loss one year ago (my Alley had been with me for 17 years - over half of my life). It is still difficult. But Phoebe was so much your cat I have no doubt she will find her way back to you and as my 3 y/o told me "she'll be painted different". She was right. 6 months ago we found Alley the second. Take this Christmas to remember and rejoice and when the time is right you'll find another delightful kitty (and one with amazingly similar personality traits). That's a sad story, but it sounds like Phoebe had a good home with you. as a cat lover, my heart goes out to you. it's a lovely post and i can tell how much she was loved. I'm so sorry for your loss. After my dog died it took me months before I stopped looking behind my desk chair to make sure I didn't roll into him when I stood up. Phoebe is clearly going to be in your hearts forever - and that's a very special thing. so very sad, hugs to you and your family. So sorry to hear about Phoebe. Hugs to you. Thanks again to everyone leaving comments--I am touched and it really means a lot to me to share this with you. Ah, my heart cries for you. Our special friends pick US.